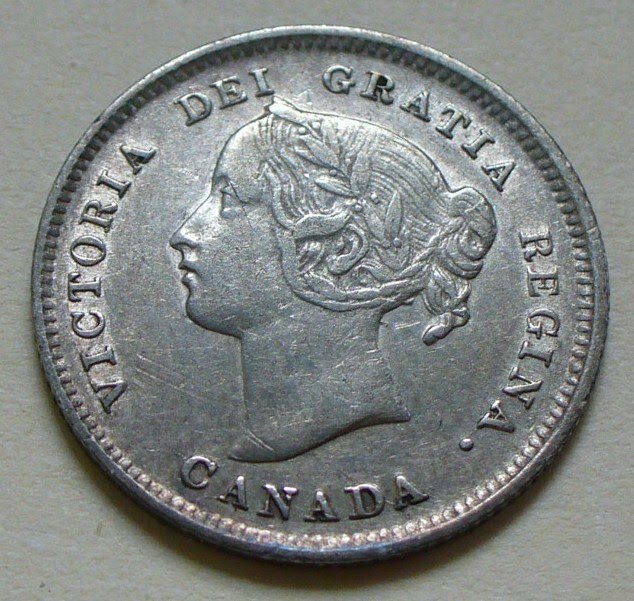 It's Victoria Day in Canada today! Ah, the freedom. But it's not political freedom we're talking here. Canada attained independence in 1982 although it's still a member of the Commonwealth of Nations and has the reigning British monarch as a figurehead. - Freedom from clothes! Leave that outerwear behind and feel the breeze on your bare skin. Yeehaw! - Freedom to plant! It doesn't matter where you live in Canada, you can safely plant your garden on or after Victoria Day and you don't have to worry about frost. - Freedom to camp! Yes, campgrounds open this weekend and quickly fill with exuberant party-goers who've shed their clothes in their eagerness to become mosquito bait. - Freedom to suntan! Canadians suffer more sunburns on Victoria Day weekend because of all those clothes they've left behind in the house. - Freedom to go to the beach! Regardless of how cold that water is, all beaches in Canada open for public swimming and scantily-clad bodies show off their ghastly white skin*. - Freedom to open the cottage. Highways are jammed as cottage country owners leave their urban homes to spend the weekend mucking dead moths, flies and rodent feces out of their chosen home-away-from-home. Need I say, Canadians thrive on Victoria Day. Victoria was born in 1819. 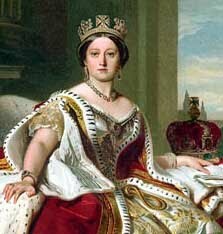 She took over the throne in 1837 at the young age of 18 upon the death of her uncle George IV. She ruled as queen of the United Kingdom of Great Britain and Ireland and empress of India until her death in 1901, when her son Edward the VII became the King of England. 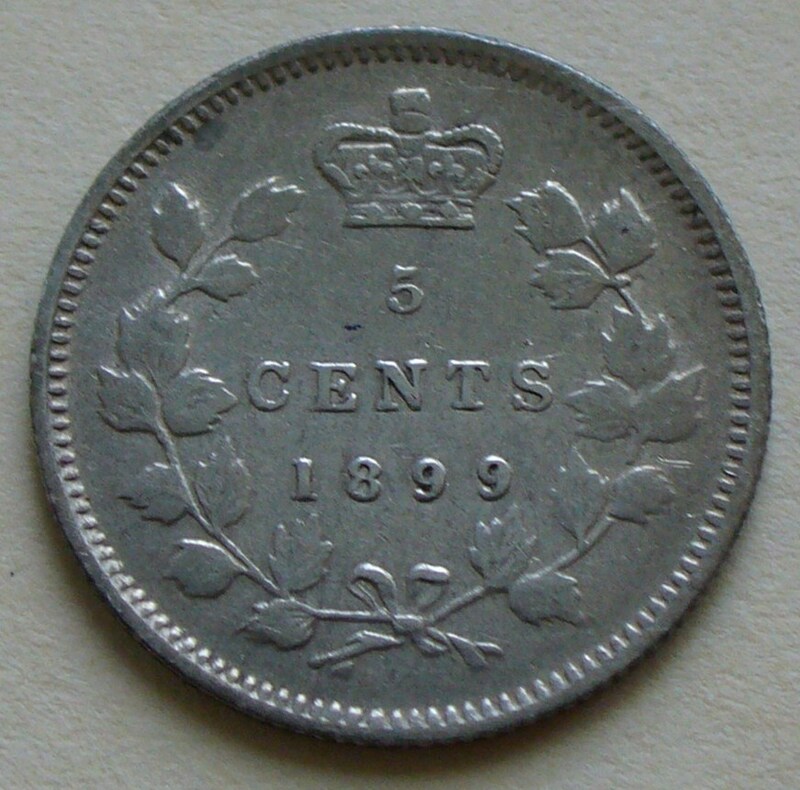 Here's a Canadian 5 cent piece from 1899 and yes, that's a young Queen Victoria you see there. 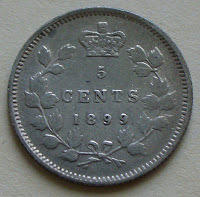 As a member of the Commonwealth of Nations (British Commonwealth), the current British monarch is displayed on the reverse of all Canadian coinage. Back in 1845, the Legislature of the Province of Canada declared May 24th, the queen's birthday, a national holiday. In 1952, an amendment to the Statutes of Canada established he Monday preceding May 25 as the actual holiday. That means Victoria Day is the 3rd Monday in May. - Her image was used on the first postage stamps ever printed back on May 6, 1840 in the United Kingdom. - Young Victoria was taught to keep her chin up by placing a prickly holly sprig under her collar. 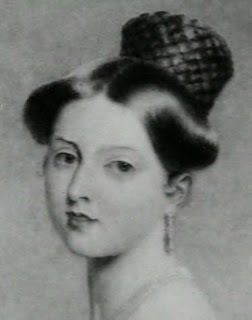 - Although she ruled for 64 years, Queen Victoria never learned to speak perfect English because her mother only spoke German at home. - Queen Victoria was the last teenager to rule England. Victoria Day is always the weekend before the U.S. Memorial Day. So, what are you doing either this long weekend or next weekend for Memorial Day? *This is not to imply all Canadians are caucasian because we aren't. Canada is made up of a diverse ethnic population. It's just that pale skin which hasn't seen the sun in 9 months looks . . . ghastly. Thanks for educating this neighbor from down South on Victoria Day...the things I don't know, hmmm. Memorial Day weekend around here means it's the start of Tourist Season in Virginia Beach. time to avoid the beach area because of the crowds of visitors. *sigh* i'm defintitely not a crowd person. time to run for the hills and camp. Deb H., I'm in Virgina Beach too. What a coincidence. You're right. I go to the beach mostly in April, May, September, and October. I want to try to go more this summer, though, for my son who likes to surf. Has it only been a year since you've dived, Deb? Would you need to get re-certified? 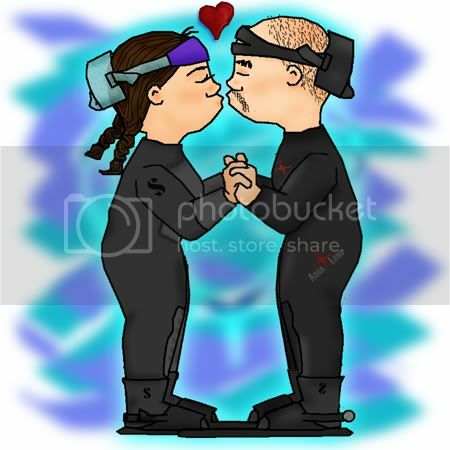 I can't remember if it was every year or second year when hubby used to dive. Yes, you definitely need a life jacket for Guppy. Extremely important if you want to take him boating. From your pics... beached whale? pu-leeze. Although, I'd suspected the mail-order bride* part was because it took you so long to find the love-of-your-life. But it was so worth it, eh. * I posted a book review about a mail-order bride on Sat. You got it, Andrea. I'm lifting up MaryGrace. 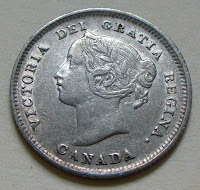 Happy Victoria Day! Sounds like fun... Memorial Day is around my dad's birthday so for me, the long weekend involves red meat and lemon merengue pie, Dad's favorites. This year it's also the Sunday School end-of-year picnic. Hopefully we won't freeze, since it's unusually brisk for late May here. Great post, Anita! Enjoy your celebrations! Very interesting, Anita! I had no idea Canada had such a holiday. Of course, it snowed again briefly here this morning... I would love to have a day we could set as the beginning of summer, when it's safe to plant, safe to put away the snow shovel, and safe to go somewhere without keeping the boots, mittens and window scraper in the back of the car! And that picture of the young Victoria is BEAUTIFUL! Wow! 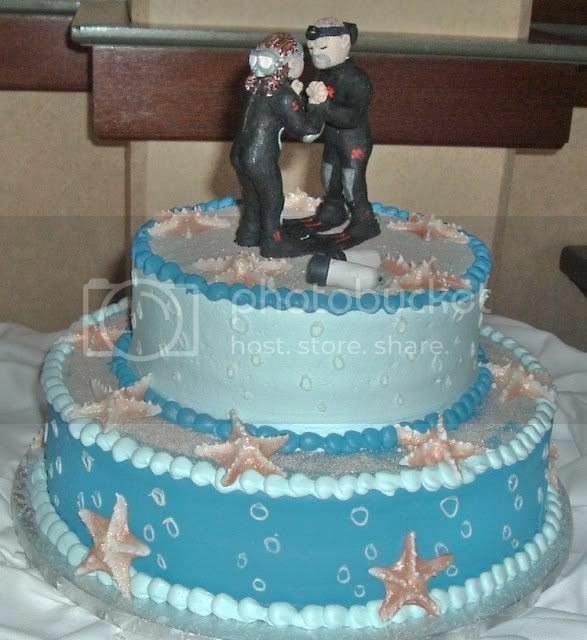 wedding toppers I've ever seen... dive buddies. They even look like Deb and her hubby! Surf at Virginia Beach? For some reason, I assumed all surfing happened on the west coast where the water's warmer. The image of young Victoria is when she was 14 yrs old. A photo of the actual painting is found at Victorian Station but I used the one I found here. Yes, she was beautiful. And I imagine having 9 kids had something to do with the famous figure most people recognize. Anita -I'm pretty sure the water on the east coast is warmer than the west coast, but I agree, the waves may generally be bigger coming in on the Pacific. I didn't realize that Canada's Victoria Day and the U.S of A's Memorial Day had so much in common. The start of macaroni salad season and time to plant the gardens here in the Northeast. Weatherwise, we (NY) seem to have started summer already. Sorry Niki. I'm looking forward to our theme this week! thanks for starting it off. Having a birthday to celebrate is an excellent way to enhance a long weekend. It creates special memories and anticipation. A sunday school picnic in May? Brrrr. When I lived in Ontario, we always had it the middle of June. Here on the prairies, it's the end of June. And that's not even near a body of water. Deb - Macaroni salad? Mmmm - BBQ time. Yes, here, too. The only reason I didn't add it in is because everyone seems to be using their BBQ earlier every year. And, it's not uncommon to smell that unmistakable BBQ scent even when there's snow on the ground. I believe the progress on sophisticated BBQ equipent has something to do with it. Sorry, but there's no way you can make me believe the cold North Atlantic Ocean is warmer than the balmy Pacific. Uh uh. Nope. Nada. Anita, interesting post! We celebrate the Queens Birthday (holiday weekend) on the second Monday in June. The holiday relates to the ruling British monarch and I'll probably be working on that day. Eye candy. Ha ha :) I admit, the surfer guys don't look too bad. I'm sorry everyone. My internet service was horrid yesterday and then an electrical storm rolled in. At 9 pm, I finally gave up, unplugged my equipment, and went to bed to read. Narelle, do you still celebrate Empire Day? When King George and Queen Elizabeth (later the Queen Mother) visited Canada in 1939, His Majesty said Canada was the only country in the Empire who marked Empire Day by remembering Queen Victoria. Or do you change the holiday to reflect the current monarch's birthday? Considering Queen Elizabeth II's birthday is actually April 21st, why do you celebrate in June? And if you're working on the 2nd Monday in June, does that mean it's not a national holdiay? Hey Angela, I would have thought you'd have yours planted already, what with the chinooks and all. My daughter lives in Calgary and has been sassing me about the warm weather for weeks. Anita, Anita What have you done??? You mentioned the lovely May 24 weekend and the weather trolls, elves and other horrid Saskatchewan creatures decided to negate everythig you said!! I only live 400 KM due north but what is happening down there? It is rain/snowing with a 35 km wind. I am dressing warmly because I have planted on the May 24 weekend all my life. Deb and Anita - I got to thinking which coast is warmer - and I may be wrong - although - it is SUCH a rare event that the Guinnes Book of World Records have been annoying me with their repeated request! I can only speak for Newfoundland, Canada's east coast, the North Atlantic, and the Queen Charlottes, across from Alaska - on the Pacific coast re which is warmer. The North Atlantic is phenomenally cold. During WWII, Canadian corvettes moving cargo to N. UK and then Russia, were covered in ice the whole trip. Nova Scotia's east coast in one place, is actually internationally known for its surfing, so it isn't be anywhere near as cold as Newfoundland but it is no way warm! The Queen Charlottes and Vancouver Island have that lovely warm current which makes them warmer - way way way warmer - no icicles for those folk - than the north Atlantic - which, by the way, have the most beautiful beaches you have ever seen - miles and miles and miles of them. Figures eh? I would swim in the ocean off the coast of BC - - but only at gunpoint - because I hate swimming in lakes or seas. I have an unreasonable fear of sharks - unreasonable as I live in the middle of Saskatchewan, which is pretty much around the centre of the continent. Anita, sorry for the late reply. I've heard of Empire Day but it hasn't been celebrated here during my lifetime. I have no idea why we celebrate in June. We already have Easter and Anzac Day public holidays around April, so this may be part of the reason. Unless the Queens Birthday holiday replaced Empire Day? Or June was King George VI's birthday? Will have to do some research on this :-) I work in retail and often work on public holidays. The only days the shops are closed where I live are Good Friday and Christmas Day.